American President Lines Ltd. which is simply referred to as APL is a major player in the ocean carrier space, with comprehensive container shipping and related services, worldwide. The company is also one of the oldest shipping companies in the world and was incepted in 1848. Initially they were called the Pacific Mail Steamship Company until 1921, when they were acquired by Dollar Steamship Lines. In 1938, the directorial board changed the name to American President Lines. Their expertise is derived from their skilled workforce and a 170 year old heritage. 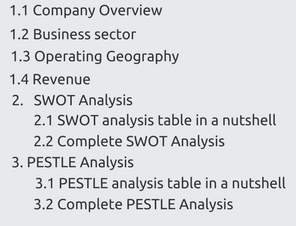 In terms of their employee headcount they are a 29000 member strong company as of 2018. The company operates in more than 70 countries across the globe, with roughly 11.7% market share and 536 vessels. In 2016 CMA CGA Group acquired Singapore-based NOL (Neptune Orient Lines),whose chief operating brand is APL (American President Lines).APL is headquartered in Scottsdale in Arizona and is also co-headquartered by a facility in Singapore to levy more clout in their Asian operation. APL runs over 110+ weekly services around the globe. American President Lines Ltd., now commonly referred to as APL, was a subsidiary of Neptune Orient Lines (NOL). It was bought over by CMA CGM based in France in 2016. APL is now a wholly owned subsidiary of CMA CGM. The acquisition was valued at $2.4 billion. 1. Risk of ownership: The Shipping industry is one of the most dangerous transport expeditions that occur on a daily basis. The risk involved is so great that every voyage will need to be executed safely and without any glitches. While operating in the high seas, there are a variety of environmental factors like wind speed, tide and weather forecasts that come into play. By promising the customer, his cargo would reach safely and adding a money-back guarantee to it, the company is doubling its propensity of risk in undertaking the voyage. 2. Hazardous Cargo: APL is one of the frontrunners in the industry when it comes to hazardous cargo. Government regulations regarding dangerous cargo vary from region to region. APL is compliant with all these regulations and is also well equipped in delivering the cargo with care. They deal in all kinds of cargo ranging from corrosive elements, inflammables, poisons and volatile gases. The IMO has devised the International Maritime Dangerous Goods Code (IMDGC) so all vessels adhere to the safety measures. APL has a Hazardous Materials Response Centre (HMRC) that is called into action as and when the need arises. 1. High Capital Investments: The High capital investments that are associated with maritime transport are a major threat to its smooth functioning. A healthy balance sheet can be maintained only if the payables and expenditures are curtailed once the economies of scale are achieved. In terms of operational efficiency, APL is truly leading from the front but this can be viewed as foolhardy when it comes to their financial spending on cargo lifting equipment. 2. Competitive Rivalry: The closest competitors to APL are CMA-CGM, NYK Line, Aker American Shipping, Anchor Line Company, Maersk, Atlantic Container Line and Eastern Steamship Lines to name a few. Evergreen Marine Company is the largest among these when it comes to all services combined and without taking into account the Alliance mergers. These Alliances have led to a certain amount of price dictatorship in certain regions of operation. Political bodies are introducing regulations to keep this under control. 1. U.S. Flag services: The U.S. government has been a patron of APL’s services for a long time. It is a distinguished accolade for a private shipping company to be able to offer their services to their government for decades. They also provide the U.S. government various in-land logistics services, acting as a critical factor in linking all foreign military locations with central operations. The company offers priority breathings at all critical ports that enable the cargo to reach the location much ahead of time. There are about 5 weekly services linking North America to Asia and Europe with feeder routes within the Middle East. 1. Online booking: Online booking has been made available to all customers on the APL website. The specifications of the cargo can be entered and even the cargo assurance protection may be availed at the same time. The same portal can be used to seek assistance for any queries you may have about your cargo. A dedicated online support team is always available 24x7 to help in tracking the order and providing a smooth customer experience. Another noteworthy feature is the See Change website and See Change Lite mobile portal that can be used by the vendors and other stakeholders in the Supply chain of APL to quickly respond to a surge in the customer demand. Logistics Super Suite and Carmichael International Service Tracking database is also better with the use of the app that is compatible across platforms like Android, Apple and Blackberry devices. The International Hub management, warehouse design techniques, green supply chain analysis by carbon footprint calculator and Freight management policies by APL are so robust that the multi country consolidation and deconsolidation is done effortlessly and inland trucking activities can also be carried out without delays. Other value added services that ensure operations are carried out well are the Shipment Optimizer portal, Advance Shipment Notice (ASN) management and Sailing schedules to determine the duration and timings of the voyage. 2. Electronic Data Interchange: The Electronic Data Interchange system with APL helps to synchronize with the client’s company and facilitates smooth information exchange. This eliminates any data loss through communication glitches. There is also no need of replicating data entry manually. APL’ systems are compatible with both ANSI-X12 that is used in America as well as the EDIFACT protocol used all over the world. A few services it offers are information on booking, bill of lading, invoicing and fund transfer. 3. SMART reefers: APL’s fleet composition is well equipped with vessels of all types required to carry out the transport of the cargo. One such important addition to the fleet is the SMART reefer. Some of the key features of these reefers are the temperature management, atmosphere management, humidity control, cold storage and live monitoring. All of these reefers are fitted with an electronic device comprising of a microprocessor that kicks into action whenever the desired conditions are required. Neptune Orient Lines Logistics 2016 Divestiture Neptune Orient Lines and its principal operating brand APL was acquired by CMA CGM for $2.4 billion. 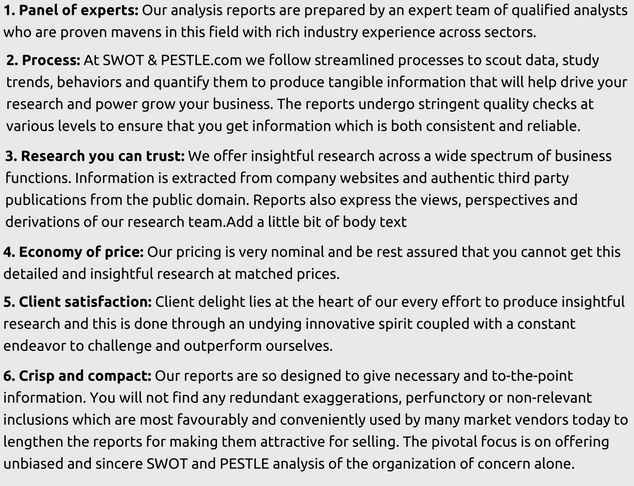 American President Lines Ltd. (APL) SWOT and PESTLE analysis has been conducted by Rohit John Kurian and reviewed by senior analysts from Barakaat Consulting. 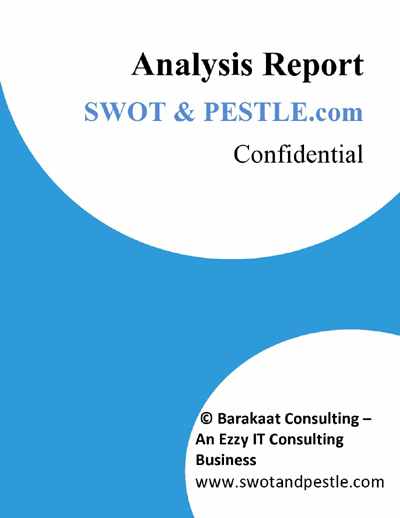 Copyright of American President Lines Ltd. (APL) SWOT and PESTLE Analysis is the property of Barakaat Consulting. Please refer to the Terms and Conditions and Disclaimer for usage guidelines.